This is my lazy guide to being productive. I am not going to lie to you guys, I am one of the worst procrastinators going and I mean, the worst. For example, before now I have walked my friends to the bus stop and then been sitting there and chatting for so long that I almost miss mine, just because I can't be bothered to get up off the bench and walk across the road to wait at my stop (being deadly serious). I'm doing it step by step starting as of about a week ago BUT in the weeks to come I am making it my mission to become a true princess of productivity with these simple steps. First things first, if you want to be remotely productive you need to not be slothful and sleepy so making sure you sleep well is key. If you don't get enough sleep your brain is never going to be able to tackle things and it makes the simplest task a pain in the backside to suss out, thus making you use more effort. So really, by making sure you're well-rested not only are you making sure you're lively and full of energy but also making sure you are spending enough quality time with your soft and squishy pal you snuggle up into after a long hard day of work. I mean let's face it, who doesn't want to drown in duvet and pillows for 7 hours of the day. However, just because I am saying you need to be well rested it does not mean I am telling you to waste your day in bed because you slept for 14 hours straight (not denying I do it on a semi-regular basis but it seriously doesn't help you become productive in any way shape or form, just it's super nice doesn't mean you should do it regularly). Most people procrastinate because they over complicate things way too much. 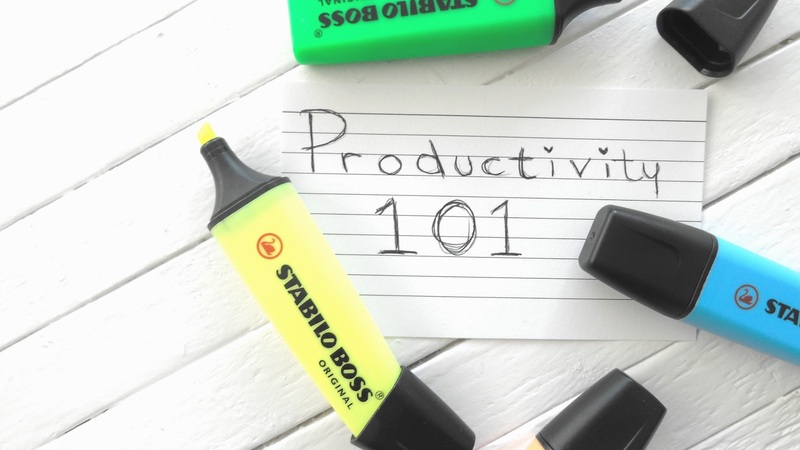 To be more productive get into the habit of trying to get things done as good as you can but in the simplest way possible. The worst way to over complicate things is by just dive right into things and not think about what you're doing properly, by stopping, thinking and simplifying you can save yourself so much time and effort. So really, it just means you can be that bit more lazy in the long run. Splitting things up into sections makes everything easier. Instead of just diving into the mass of fabric you call a wardrobe to "tidy", get things out in sections, get rid of what you need them BAM sorted and it makes things much less daunting as well if you split things up like that. But not only should you split each individual task up to maximise efficiency and productivity but splitting your days up like that also makes thing a whole lot easier, you just need to remember that two productive and efficient days are better than one stressed, tedious and half assed day jam packed full of things to do. Your set-up and workspace are a crucial part of just getting things done, you need to make sure that wherever you need to get things done runs in the most efficient way possible. This goes for in work and at home if you're trying to get things done make sure that before you start you have everything you need at hand, not only does it stop you having to get up every 5 minutes to go and get something which inevitably ends up being sucked into the vortex that is twitter or neko atsume but it also makes things so much easier and saves you time. However if your procrastination revolves around mundane every-day tasks that you just can not be bothered with you literally just need to do it, because the sooner you do, like going to your bus stop, the sooner you can binge watch that TV show you were eyeing up on Netflix with the super hot cast. Yeah, you know the one. Got a bad procrastination story or some tips on becoming a productivity princess? Leave it in the comments!